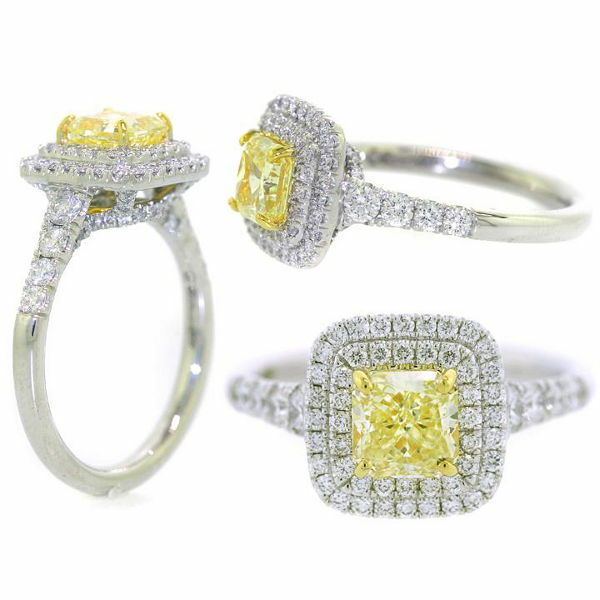 1.03 carat radiant cut GIA certified fancy yellow diamond engagement ring. The platinum double halo setting features 94 round diamonds bringing the ring total diamond weight to 1.73 carat. Dedicated consultants, 24/7 phone service 365 days a year. Naturally Colored by Peled Diamonds, registered diamond dealer and manufacturer, specializing in Natural Fancy Color Diamonds - Member of the IDI. Offering wide variety of Loose Colored Diamonds at wholesale prices. Create your own rings & diamond engagement rings at half the price.